Monday’s chapel prepares students and candidates for the upcoming elections through prayer and campaigning. As the Student Government Association and Student Missionary Union get ready for their annual elections, candidates were given the opportunity to campaign during SGA chapel on Monday. Director of Spiritual Development Chad Miller started the session by focusing on an integration of prayer in deciding who to vote for. After the prayer session, current SGA president Sierra McCoy and SMU president Jeremy Lupinacci were invited up on stage to share their reflections as they near the conclusions of their term of service. Both presidents emphasized the significance of participating in the elections. SGA president candidate Renee Waller and SGA vice president candidate Seth Gladysz presented their campaign with three aspects—bringing student groups together, pursuing a proactive attitude and providing financial alleviation for students through marketing. 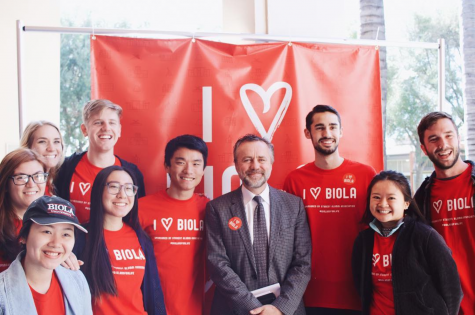 “SGA is in a strategic position to build up the body of Christ here at Biola, in ways we never seen before,” Waller said. Sophomore engineering major Nathan Ankrum expects the next SGA administration to bring changes. Micheal shared her goals of better relations with missionary organizations and bringing forth a missionary revival in the Biola community. Jacock shared his pursuit for an expansive view over both including local and global mission fields. “Biola, if I’m being real, we need a revival for missions, we need our hearts to be on fire again and be obedient to the call that God called on our lives,” Jacocks said.